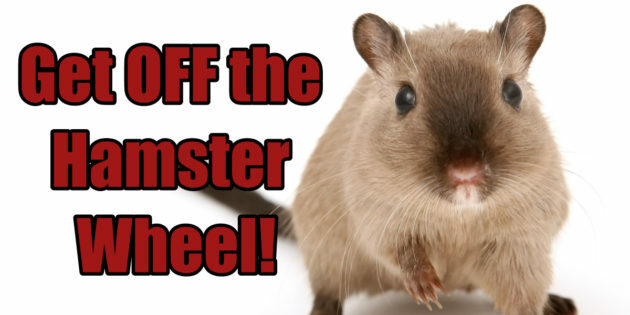 Have you ever watched a hamster running on his little wheel? He’s running….and running…and never getting anywhere. Life is like that as well. How many times have you been running…putting in a ton of effort…and it didn’t feel like you were getting anywhere? It could have been at a job. You put in everything you have…and someone else gets the promotion you were after. Office politics held you down, while someone else gets rich off your labor. Or it could be in your financial life. It seems like you’re never getting out of debt. You’re running in place…and perhaps even going backwards. Or it happens in business as well. You’re doing all these different activities…and it seems like your to-do list keeps getting longer! We sometimes talk about entrepreneurs putting in 60+ hour weeks, but I’ve seen them going for 80 or 100-hour weeks. Every waking moment is dedicated to their business…and it still seems like they’re not getting anywhere. I can’t help you in other areas of life, but I’ve helped a lot of clients earn more while working less in their online business. The biggest secret is to get off the hamster wheel! Stop running for a moment. What’s working? And what’s not? As entrepreneurs we have this crazy idea of what we should be able to accomplish…and we’re constantly beating ourselves up about everything that’s not finished. You need to give yourself permission to be human. Yes, I know that’s tough. Perfectionism is strong with us. We’re not normal mortals. We can do three times as much as normal humans. At least it’s not true for long. You’re motivated more because it’s something you own…instead of just working here. But you still have limits. There are times that I joke that any project will take three times as long and cost twice as much as I plan. And that’s a pretty good rule of thumb. Yet so many of us still have this huge to-do list where it’s simply not practical to finish it all. This came up multiple times with clients last week. Three clients come to mind specifically. With all three clients we discussed the highest and best use of their time over the next few weeks. We planned out the exact steps they needed to leverage a current success in their business and maximize the results. And after we finished…they brought up a totally different project they simply didn’t have time for right now. If they were on their own…I know they would have walked away feeling guilty because they didn’t have time for that secondary priority. Or even worse they may have tried to do it at the same time. Both projects would have suffered. Sometimes it’s hard to judge where your greatest leverage is right now. Every client I deal with has more than enough opportunities in front of them. We work together to choose the highest and best use of their time. Many times that comes through a process of subtraction. What isn’t worth focusing on right now? What will they give up? The greatest growth in your business comes from subtracting the distractions. If you’re not sure about where you should focus for the next phase (or even the first phase) in your business…that’s the type of question you can bring to our Q&A in the Monthly Mentor Club. We have a members-only webinar scheduled for Friday at noon Eastern time. Join the Club today. Register for the webinar. Bring your questions…and let’s get them answered. There are virtually limitless opportunities available to us today. You can have anything you want in life, but you can’t have everything. ‘Having it all’ is a lie we’re continually told. You have to choose what’s important. And if it’s an online business, we can help you in the Club. The price is going up for anyone who joins after January 31st. How Long Till YOU Make Money Online?